It was dark, grey and started to rain just as we showed up. We sat in the car checking our iPhone weather and were certain it would stop any sec. It did. We unloaded and headed to the bleachers. The field was empty: no boys, no coaches. No rain. In our enthusiasm to get started, we neglected to take a before picture. Pretty soon, Mason showed up with a hula hoe, and without prompting starting hoeing around the bleachers. Really, he did that. (I was quite impressed.) 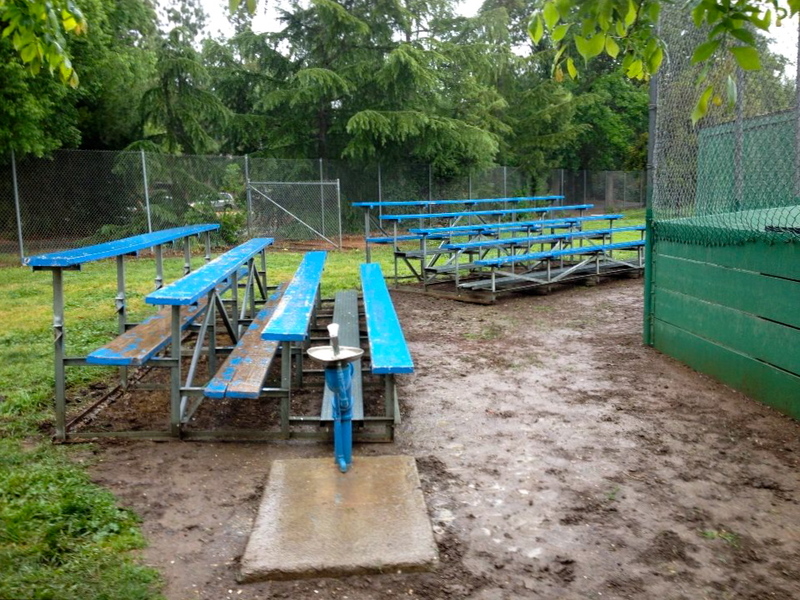 We took advantage of his youthful catcher bulk and the three of us raised one set of bleachers and rested it on its backside so we could access the under part. And damn, pretty soon, Coach Rich was out there quietly working beside us, then, one-by-one, players, then another coach or two. Then Gabe’s dad, Alex. And before you knew it, we were a crowd of nearly 20. I was a bit chagrined when Coach Creely showed up and we’d effectively co-opted the practice.. but he seemed happy enough. I was also feeling a bit of the Tom Sawyer. But kept working, because that would have been weird… to let the boys do all the work.. tempting though it was. Two hours later, the job was done. And more besides (like, the unplanned area around the bullpen). Oh, and it rained. And rained and rained and rained. It was increasingly muddy and gooey and oh.. so.. messy… but, once there, we just worked through it…and we got a lot of the weeds. Here are a few shots, with some photos courtesy of Korlyn. 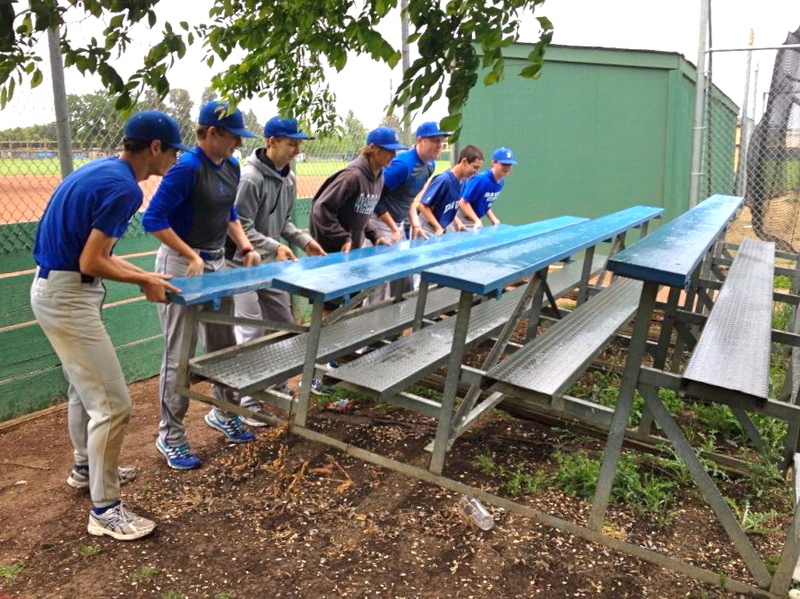 This bleacher covered a less egregious area, but it gives you a sense of the “before.” Here is a shot of the boys lifting the bleacher to rest on its back. They’re pretty heavy. An hour or so later, here’s a shot of the bleacher going back down. Here they are in full worker mode. I just can’t tell you how charming it was to see them work together like this with nary a grumble. 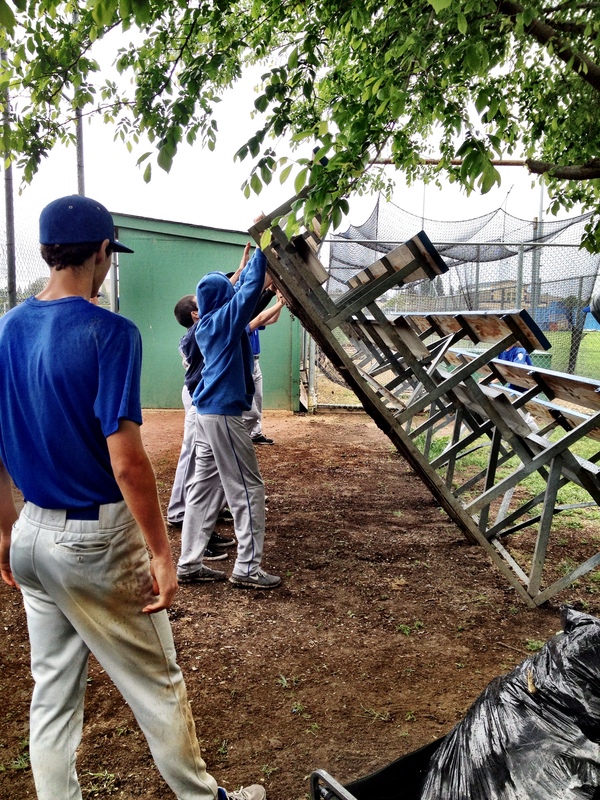 Coach Creely said he has the boys do a lot of field and bleacher maintenance, which is both an upside and a downside to district and city budget cuts. They even got creative in trimming branches in the bullpen. Honest to god, pitchers have had to deal with low hanging branches for the last month or so, seriously compromising the arc of their practice pitches. 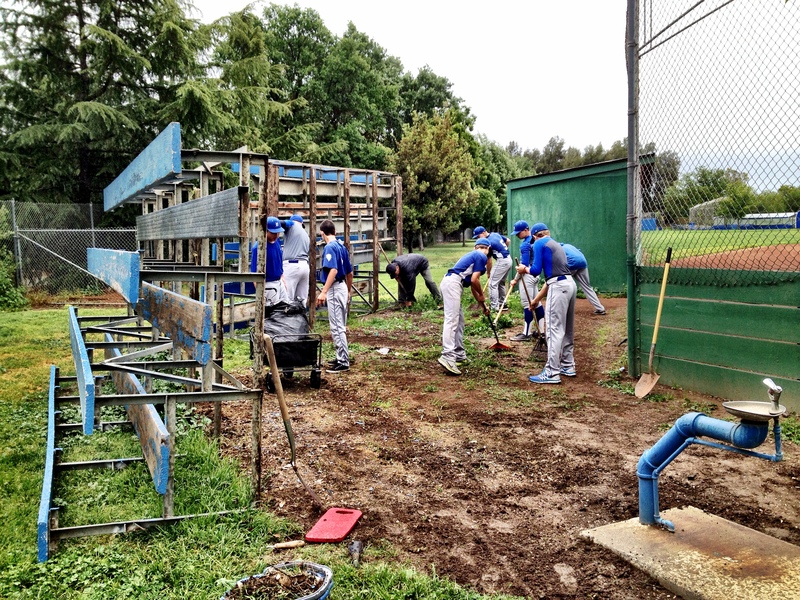 Not to mention, it’s been a bit embarrassing when visiting teams see that one-and-only bullpen… so getting this cleaned up was an added bonus. 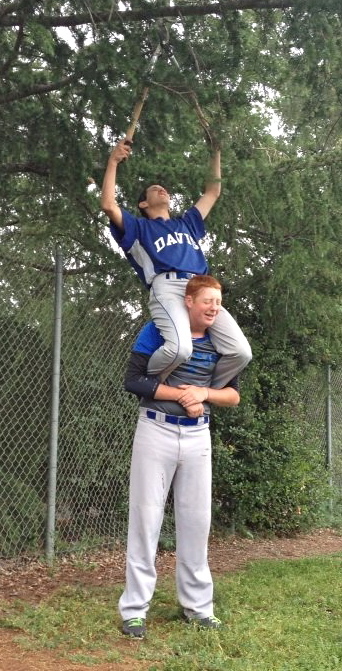 Biggest guy on team hoists littlest guy on team. Good job boys! And here, more or less, is the finished product. We filled about 8-10 large, black garbage bags, and left for the maintenance crew a huge pile of branches from offending trees and shrubs. Next up: sand and paint those bleachers!